Spellman Brady & Company, an award-winning interior design firm, recently completed the comprehensive 71,000 sq. 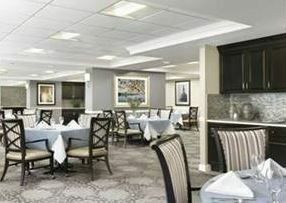 ft. interior design for the Kingswood Senior Living Community expansion and renovation in Kansas City, Missouri. After 35 years, Kingswood Senior Living Community recognized that their residents needed more space, more amenities and more choices. Spellman Brady understood the importance for the community to embrace the changes, which included rethinking the space for new uses. Beyond the new entrance, bistro, auditorium, and independent living villas, the remodeled assisted living and memory care apartments, administrative office, wellness and other common amenity areas all have an immediate impact. 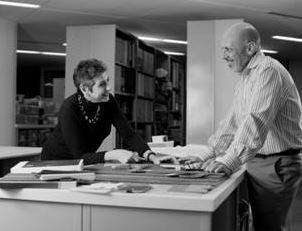 Initially, Spellman Brady engaged the residents, staff, family members and potential residents with a two-day design survey that focused on furniture, color palettes, millwork, and many other distinctive characteristics that helped guide the design-style including “test-driving” dining chairs. 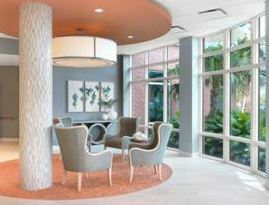 By the end of the expansion and renovation, the interior design helped redefined traditional details with unique memory care digital picture frames, furniture with curved lines, and customized fabric transforming the resident experience. Kansas City is a vibrant, exciting city that is metropolitan, yet retains its small town feel. Kingswood Senior Living joins in this excitement with their new interiors that reflect the residences and lifestyles of their community. Kingswood is a not-for-profit Life Plan Community established in 1982 in the heart of Kansas City, Missouri and is managed in partnership with Life Care Services™, an LCS® Company. Spellman Brady & Company is a St. Louis–based interior design firm specializing in Senior Living, Healthcare and Higher Education environments. 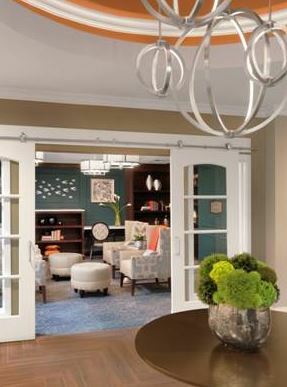 Spellman Brady and Company, an award-winning interior design firm, was selected as a Top 10 Finalist and received the “Reader’s Choice Award” for their comprehensive interior design renovation of The Residences of Thomas Circle in Washington, D.C. from “Environments for Aging” (EFA) magazine’s 2017 Remodel/Renovation Competition for senior living communities. 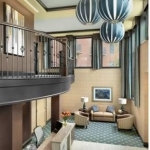 Spellman Brady & Company is a St. Louis–based interior design firm specializing in senior living, healthcare, and higher education environments. 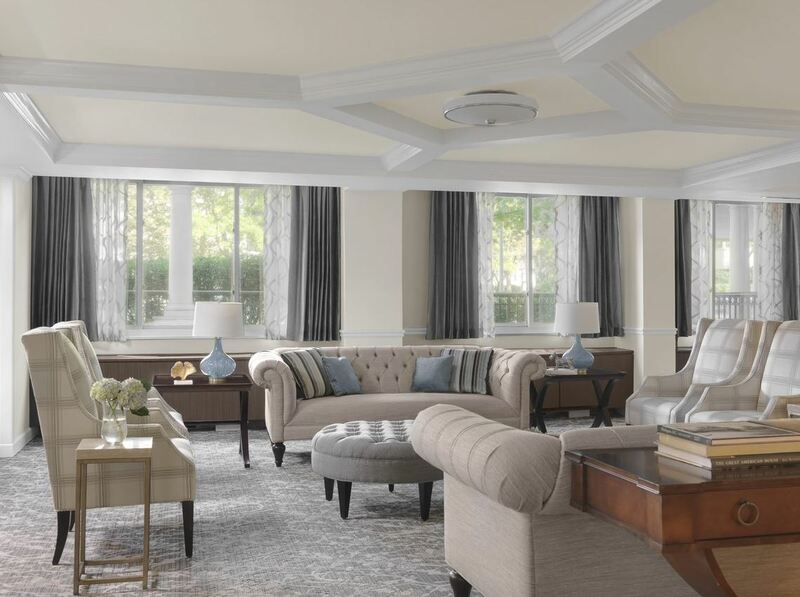 Spellman Brady & Company, an award-winning interior design firm, was engaged by a subsidiary of Bridge Investment Group and Meridian Senior Living to create a comprehensive interior design for The Residences at Thomas Circle, a senior living community in Washington, D.C. Although a 63-year-old property, the renovated The Residences at Thomas Circle melds seamlessly with today’s living. Spellman Brady accomplished this through infused light, classic furnishings, fine art landmark photography, and an updated space plan. With the new space plan the multifunctional areas are energized social gathering hotspots, which include a hospitality area with kitchen, reception, dining room, and living room. The historic Residences at Thomas Circle is surrounded by a unique and vibrant residential neighborhood located only blocks away from the White House. With hospitality in mind, the interior is now timeless and sophisticated showcasing the natural light and historical architecture of the surrounding community. Bridge Investment Group is a real estate investment firm specializing in value-added opportunities in senior housing and medical properties, such as refurbishment and renovation, adding services and amenities investing primarily in the United States. Meridian Senior Living, the project’s operation/management Company, provides outstanding care and services for more than 7,000 residents in a comfortable, home-like setting at communities across the United States. Spellman Brady & Company is an award-winning St. Louis–based interior design firm specializing in senior living, healthcare, and higher education environments.  Touchmark at Coffee Creek – Edmond, Oklahoma – The 25-acre full-service community has chosen Spellman Brady for their interior design services with focus around the independent and assisted living common areas of the existing three-story, 50,000 sf facility renovation.  Parkway Place – Houston, Texas – Spellman Brady is responsible for the interior design for a new café and state-of-the-art rehabilitation therapy gym, as well as the renovation of three independent living buildings; and the common areas of the current assisted living, memory care, and skilled nursing communities.  Village Walk – Patchoque, New York – The all-new supportive senior living community has selected Spellman Brady to develop the interior design for their assisted living and memory care of their newly constructed five-story, 82,300 sf facility. Spellman Brady & Company recently completed a comprehensive interior design package for Bethesda Health Group’s newest Assisted Living and Memory Support community, Bethesda Hawthorne Place, located in the Webster Groves/Kirkwood area of St. Louis, Missouri. 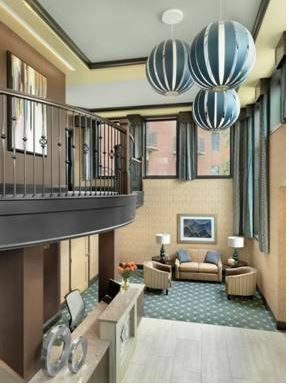 Spellman Brady was responsible for the interior design, finishes, furniture and artwork selection for the new facility. Hawthorne Place consists of two Assisted Living households on two floors totaling 38 apartments and one Memory Support household for 20 resident apartments. 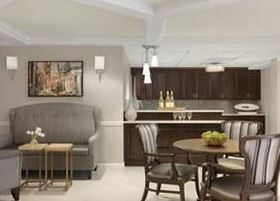 In addition, to the one and two- bedroom apartments, the Assisted Living households feature a hearth room, several lounge spaces, secured outdoor courtyards, a main dining room, kitchen and activity space, as well as a private dining room. The facility’s overall amenities also include a dramatic entry lobby, grand staircase, library, fitness center, salon, spa and a chapel. Building on the finish standards that they have developed for previous Bethesda Health projects, Spellman Brady created an overall design concept for Hawthorne Place that has refreshing transitional aesthetics, bold and comfortable with color. They achieved this by utilizing a warm-neutral color palette with pops of tangerine, navy, and aqua colors. The finishes are complemented with millwork, furniture and light fixtures that feature clean, crisp lines of timeless simplicity. When visitors enter the facility, they are greeted by a reception desk accented in front of a stone wall which features lighting to showcase the Hawthorne Place logo. As they move through the space, they encounter bright and open community spaces that are visually tied together through the use of white millwork columns, trim work, ceiling moldings and details that are rich in detail, yet sophisticated and restrained. Adjacent to the larger community spaces are smaller-scaled specialized function rooms – such as the library, chapel, hearth rooms, sitting parlor and private dining rooms – which are discreetly defined by the use of custom sliding doors. The sliding glass doors are detailed in the same crisp white wood as the rest of the project’s millwork and look like large windows to open up, yet create privacy for those areas. In addition to opening-up floor space by eliminating area for door swings, the glass sliders allow residents visual contact with the variety of activities and add a classic contemporary architectural element. To help maximize the facility’s inviting sense of home, hearth rooms have a working fireplace with white coordinating fireplace surround, detailed millwork columns, coffered ceiling and a custom carpet to look like an area rug. All dining rooms have a custom-built hydration station, a design feature wall constructed of acrylic and wood materials with an adjacent activity space for smaller group sessions. For the Memory Support and the Assisted Living households, Spellman Brady used the different color palettes to give each household its own identity, while still maintaining an overall cohesive feel for the facility. To reinforce a residential feel in the Assisted Living corridors, custom carpet designs were utilized with “area rug designs” inserted at apartment entries which also help residents identify their unit. For the Memory Support household, four differently detailed resident entry door styles were painted various colors which help residents to remember apartment location, as well as serve as a wayfinding tool. In addition to Spellman Brady, the project team consisted of three other St. Louis firms – The Lawrence Group, architects for the project; Paric, the project’s general contractor; and Hercules Construction, construction manager. Bethesda Health Group provides exceptional senior living, care and services through its retirement communities, skilled nursing home communities and home and community based programs, which place equal focus on quality and value. Spellman Brady and Company is proud to announce that November 2016 mark’s the firm’s 25th anniversary. The St. Louis–based interior design firm was founded in 1991 by Diana Brady Spellman and Stan Spellman. Today, the firm consists of 30 employees and specializes in Healthcare, Higher Education and Senior Living environments. Since 1991, the firm has successfully completed over 6,250 projects in 41 states. For more information about Spellman Brady & Company, please visit www.spellmanbrady.com.